Most of these were no surprise to me. 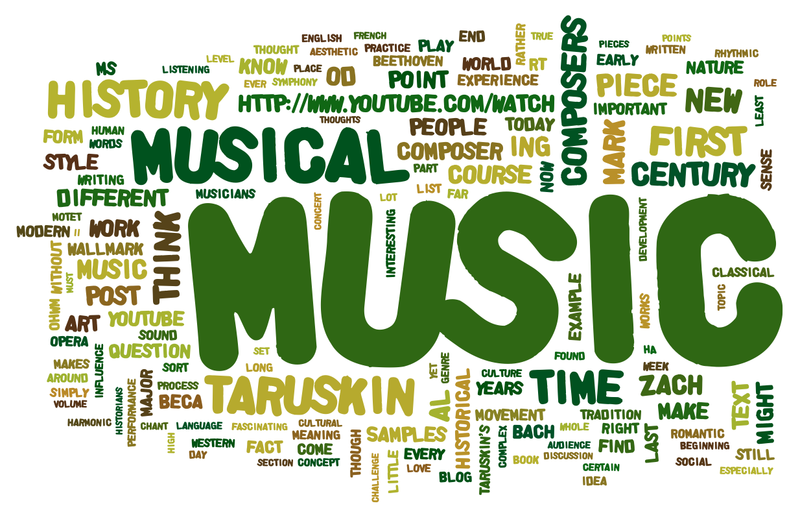 Music, musical, history, composer, Taruskin—all of these are the building blocks of our discussion. I was pleasantly surprised to see the “youtube” reference so prominently displayed, meaning that we posted a good number of musical examples. Words I wish were more prominent on this list: FOP, passus duriusculus, feint. Hi there! I could have sworn I’ve visited your blog before but after going through a few of the posts I realized it’s new to me. Anyhow, I’m definitely pleased I stumbled upon it and I’ll be bookmarking it and checking back often! I have learn a few excellent stuff here. Definitely value bookmarking for revisiting. I wonder how much attempt you place to make this sort of magnificent informative website.